I enjoy travelling and spent two years travelling throughout southern Africa and southeast Asia, which was one of my most memorable experiences. I enjoy reading and hiking, and spending time with friends and family. 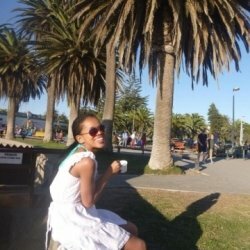 I am passionate about people and am currently completing my Honours Degree in Psychology.My first degree was a Law Degree, and I completed my articles in law but I decided to pursue a degree that was more in line with the who I am, and that would involve interaction with and helping others. While I was studying law at Wits, I was requested by the law faculty to tutor first year students. This was my first experience as a tutor and I absolutely loved it. It was the class I looked most forward to every week. Whilst completing my articles, I volunteered at an underprivileged school in Johannesburg CBD. As a volunteer, I tutored English to the matric class. Their marks improved dramatically and this brought me so much joy. During the time I went travelling abroad, I taught English to university students in Thailand, and taught grade 1- 7 students English in South Korea. I am currently tutoring English, Afrikaans, Law and Psychology. I find that often tutoring is not simply about teaching the material. It is about teaching it in way that is suited to the particular student and in doing so building the student's confidence. It is also important to have fun with the material, to be so well-prepared for a lesson that you can engage with the work in a way that is engaging and stimulating.